Camp fyrefly, a four-day retreat for LGBTQ youth, is coming to Ontario for the first time this summer and will be hosted by Trent University. The camp’s arts-based program runs in four cities each summer and includes activities in the visual and performing arts, as well as workshops about youth social issues. The University of Alberta launched the camp in Edmonton in 2004. Organizers brought the retreat to Saskatoon, Regina and Calgary, and they’re now setting out for Peterborough from July 13 to 16. “It certainly was a dream for us to take the camp across Canada and make it a national program,” says André Grace, co-founder of Camp fYrefly and director of the Institute for Sexual Minority Studies and Services at the U of A. Since a significant number of campers were coming all the way from Ontario, Dr. Grace reached out to colleagues at Trent about expanding there. 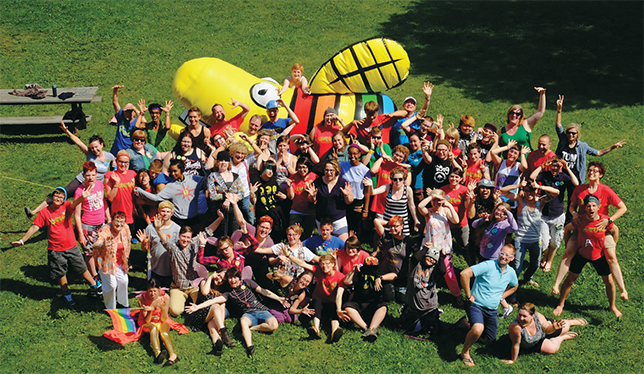 Camp fYrefly’s Edmonton cohort in 2014. Photo by Bevan Sauks. “Universities have tremendous resources that can be used to provide in-kind supports,” he says. “I think it’s creating an opportunity for those of us in the university to give back in a very tangible way,” he says. Trent is home to a new youth-oriented outreach club that works to raise awareness about discrimination against people who identify as LGBTQ. The university also regularly facilitates Positive Space training to encourage staff, faculty and students to learn about sexual and gender identities. Organizers at Trent are modelling inclusivity in part by engaging the help of undergraduate students in planning, fundraising and facilitating activities for campers. And like its Western counterparts, the Ontario camp is collaborating with community organizations. The Peterborough Police Service, for example, will co-host a session on health and safety for campers.